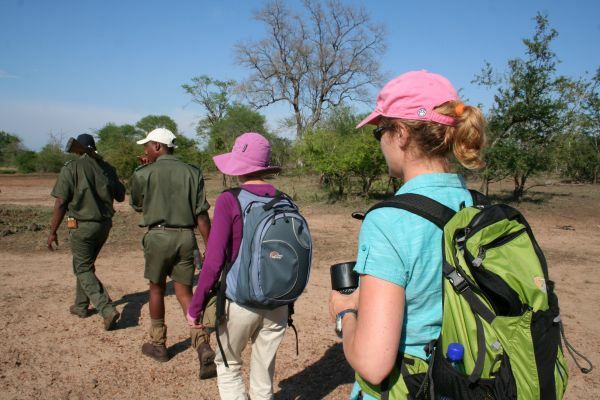 We took a trip to Kruger National Park with Caoimhe. 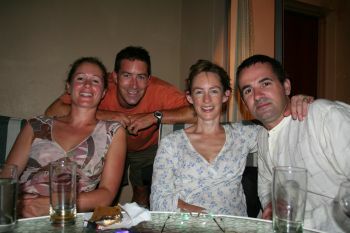 Carl and Fionan for a long weekend from Maputo. Caoimhe et al. are well situated in Maputo for exploring South Africa – the nearest border at Lebombo is just an hour’s drive away. 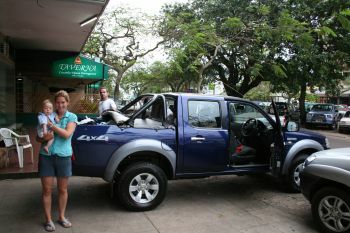 We hit the road early on Saturday morning (3rd November), our rented 4×4 pick up truck ready for action. We hit the border at 7am, thinking we will really have beaten the crowds too it…not to be! The border post was bedlam! Shopping in South Africa has become very popular with Mozambicans, as all items except local produce (which is limited) is up to 4 times cheaper accross the border in S Africa. So, there were many empty cars and buses heading the same way as us, and also all forms of transport loaded to the hilt with everything from beds to biscuits heading back into Mozambique! We got through without too much sweat, and headed down to road to Komatipoort where we had a well deserved breakfast and coffee. After a brief rest (seeing as our day began at 5am) we made our first foray into the park, through the Crocodile Gate and the south east corner of the park. It was very very hot! 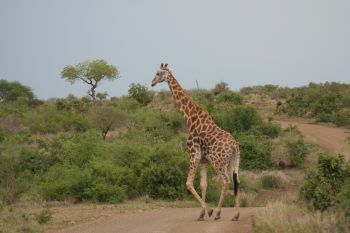 All eyes were on the bush as we drove along, and we were lucky to see giraffe, wildebeest, warthogs, a rhino and some zebra. White Rhino – less white than expected! Cathal, Carl and I did a sunset drive with a guide that evening. 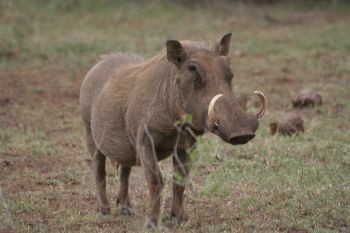 The guide took the group along routes she thought there would be interesting animals to see – and sure enough we added hippo, hyena and white rhino to the tally!! Another early start the next morning for Caoimhe, Cathal and I, as we headed into the park for 4.45am for a bush walk. This being the third early start in a row, we were rather tired! 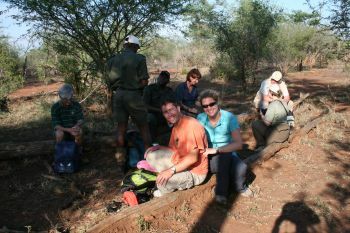 However, we were rewarded by a beautiful dawn, and a couple of hours strolling through the bush, accompanied by two strapping armed guards. It was more about tracking animals, looking for signs of them being there…seeing the old remains of a village (the inhabitants of the area were rehoused outside the realm of the park in 1927, just before it opened to the public). We successfully tracked two white rhino – but before we got too close, a herd of wildebeest spotted us, and went up to the rhino to warn them with loud snorting! Sure enough they all soon trotted off! 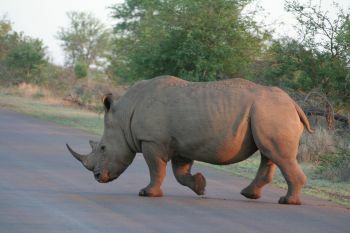 I felt we had gotten close enough though – I didn’t fancy a shoot out if the rhino charged! Cathal & Jane enjoying picnic – 7am! 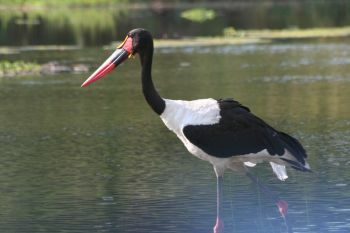 An evening drive added some more animals – water buffalo and a very large stork. The weather was HOT HOT HOT for our weekend in Kruger, but it cooled down sufficiently to enjoy a barbie on our verandah at night – and no mozzies either – bonus! We finished our weekend with yet another early start – 5am – to go for a drive through the park, then headed back over the border to Mozambique. It was an excellent weekend, great to see some of the “big 5”. Although it is a matter of luck, we were disappointed not to see any cats – leopards or lions. Quite elusive! cathal – this website and the whole trip are outt sight. well done man – and well done Jane too – fair flippin play to yiz!